Jamie Foxx, Christoph Waltz & Leonardo DiCaprio Feature In First Images From Quentin Tarantino’s 'DJANGO UNCHAINED'! 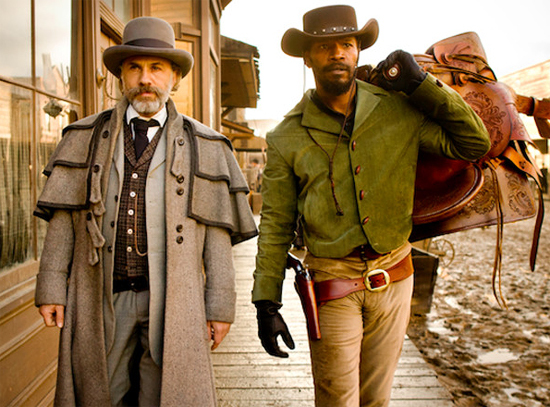 The first two images from Quentin Tarantino’s upcoming Sergio Leone inspired spaghetti western Django Unchained have been released via EW. In the movie Jamie Foxx plays the title role of Django, a slave who is liberated & taught the tricks of the trade by a German bounty hunter [Christoph Waltz]. Django’s real desire is to be reunited with his wife [Kerry Washington], who winds up in a variety of unsavory places & whose travails drive the plot. It leads to a confrontation in Candyland, a ranch owned by the notorious Calvin Candie [Leonardo DiCaprio]. Hit the jump for the details. 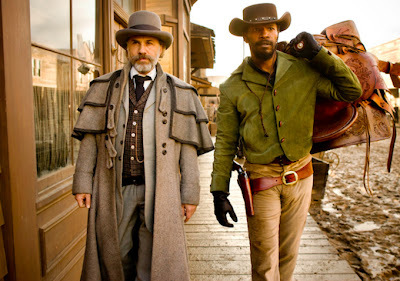 Synopsis: "Set in the South two years before the Civil War, “Django Unchained” stars Academy Award®-winner Jamie Foxx as Django, a slave whose brutal history with his former owners lands him face-to-face with German-born bounty hunter Dr. King Schultz (Academy Award®-winner Christoph Waltz). Schultz is on the trail of the murderous Brittle brothers, and only Django can lead him to his bounty. The unorthodox Schultz acquires Django with a promise to free him upon the capture of the Brittles – dead or alive. Success leads Schultz to free Django, though the two men choose not to go their separate ways. Instead, Schultz seeks out the South’s most wanted criminals with Django by his side. Honing vital hunting skills, Django remains focused on one goal: finding and rescuing Broomhilda (Kerry Washington), the wife he lost to the slave trade long ago. 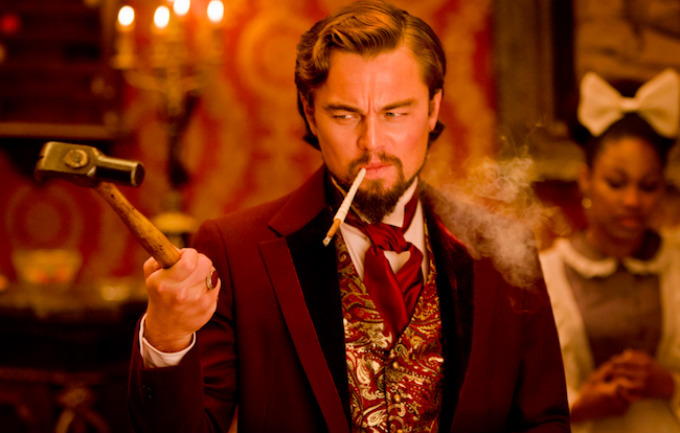 Django and Schultz’s search ultimately leads them to Calvin Candie (Academy Award®-nominee Leonardo DiCaprio), the proprietor of “Candyland,” an infamous plantation where slaves are groomed by trainer Ace Woody (Kurt Russell) to battle each other for sport. Exploring the compound under false pretenses, Django and Schultz arouse the suspicion of Stephen (Academy Award®-nominee Samuel L. Jackson), Candie’s trusted house slave. Their moves are marked, and a treacherous organization closes in on them. If Django and Schultz are to escape with Broomhilda, they must choose between independence and solidarity, between sacrifice and survival…Written and directed by Academy Award®-winner Quentin Tarantino, DJANGO UNCHAINED is produced by Stacey Sher, Pilar Savone and Reginald Hudlin. The executive producers are Harvey and Bob Weinstein, Michael Shamberg, Shannon McIntosh, and James Skotchdopole. DJANGO UNCHAINED will be released in the U.S. on December 25, 2012, and internationally by Sony Pictures Releasing International." I'm reading: Jamie Foxx, Christoph Waltz & Leonardo DiCaprio Feature In First Images From Quentin Tarantino’s 'DJANGO UNCHAINED'!Tweet this!